ARCHOS unveils today its ARCHOS 50f Helium. Demonstrated next week at IFA 2016, available in October 2016, this model places itself as the legacy product of the Helium range. It combines an HD screen, 2 GB of RAM and 32 GB of internal storage, 4G/LTE connectivity, a fingerprint sensor, runs on Google Android 6.0 (Marshmallow), all in an elegant package for an affordable price. 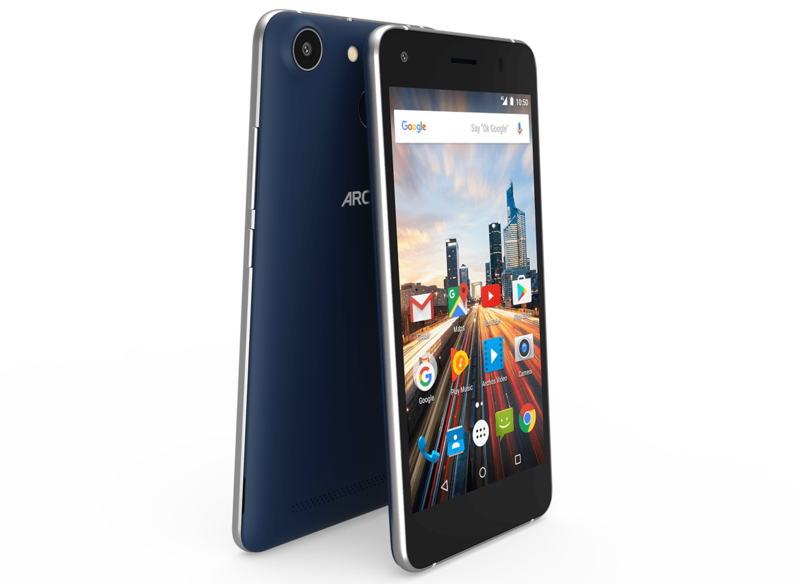 The ARCHOS 50f Helium features a premium design, with rounded edges and metal finishes. Common on high-end products, ARCHOS has chosen to include a fingerprint sensor on a budget friendly smartphone. Located on the backside, the sensor allows for an ease of use by unlocking the smartphone in just one second. It sports a 5-inch IPS HD screen with a display resolution of 1280 x 720 pixels, for accurate colour reproduction and large viewing angles. The ARCHOS 50f Helium offers a 4G/LTE connectivity, providing fast speeds especially for multimedia content downloads. It is powered by a quad-core Qualcomm Snapdragon 210 chip and 2 GB of RAM. It has 32 GB of internal storage, which can be expanded up to 128 GB with a microSD card. It includes two cameras: 8 MP with autofocus and LED flash on the back, 2 MP at the front, to benefit from all the essentials in terms of photo and video. The ARCHOS 50f Helium packs a 2000 mAh removable battery. Google Now, with its focus on “context” and its improved digital assistant, for a better understanding of where the user is and what he/she will need to know as a result. Customisable lock screen message, a new textbox that is the perfect place for motivational quotes, important reminders, name tags and much more. Doze, that uses motion sensors to detect when the smartphone is not moving, enters automatically in a deep sleep, stopping all non-essential tasks such as Wi-Fi, syncs and jobs until the handset starts moving again, optimising drastically the battery life. It gives a complete access to the Google Play Store and its millions of apps. A Lite version, with 1 GB RAM and 8 GB of internal storage, will also be available at a lower price.